It’s difficult to imagine life without the help of electricity. It may be possible to live without electricity, but not without challenges and sacrifice. After all, electricity powers everyone’s lights, appliances, heat, and communication devices. Despite the fact that it is never recommended to tinker with your electric system, unless you possess certified or in-depth knowledge of electricity yourself, a residential electrician urges his clients to at least know the basics of their home’s circuitry to avoid any potential accidents. Electricity travels from a power plant through a power grid that includes power stations, transformers, power lines, and other conduits on the way to your home. 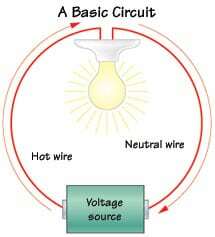 There, you have a three-wire service composed of two hotwires and one neutral wire to make a 240-volt circuit, which is enough to power larger appliances, such as an HVAC system. The central distribution point is usually found inside the home’s main panel, while the amount of electricity that runs to your house is measured by an electric meter. The current flows from source to appliances and then back to the power source, which is why any interruption in its path will render the circulation dead. Sub-panels can also be used to facilitate circuits for large appliances, like those commonly found in the kitchen and laundry room, though these are still connected to the main panel. While the following problems might seem trivial at first glance, they are actually indicative of a much greater problem that needs a professional electrician to fix. Flickering lights might mean you have to replace a bulb, but you might be facing a faulty fixture or a poor connection if it still flickers after replacing it with a new bulb. Either way, you will need a trained electrician to safely resolve the problem. If your consumption remains the same yet your utility bills keep rising, it might mean that you need an electrician to assess the energy efficiency of your appliances and replace (or upgrade) those that prove to be draining your current. When your lights or ceiling fans are emitting a strange and conspicuous amount of heat, there may be something seriously awry with your wiring. This problem needs to be addressed immediately because hot ceiling fixtures are a safety hazard and can lead to accidental fire if left ignored. By having a basic knowledge of your home’s electrical system, you can effectively monitor and detect potential problems and hazards, enabling you to define and report the issue to your electrician for an immediate repair.